Keeping track of your tasks in your head might work for a while. Sooner or later you are going to forget to do some of your most important tasks. 2Do for iPad is a powerful task manager that provides you with everything you need to keep track of your tasks and keep your projects on track. It syncs with popular services such as Dropbox to make you more productive. The 2Do app is quite elegant and easy to use. Adding and organizing tasks can’t be any either. You get tabbed lists. 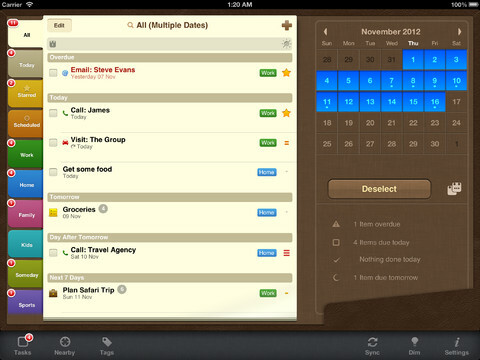 Tasks can be organized using drag & drop. 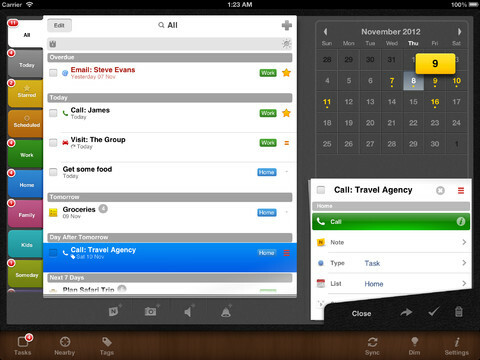 2Do is powerful enough to handle big projects and simple tasks lists. Repeating tasks with no end dates are covered as well. The forgetful among us can always use alerts to get notified when their tasks are due. We like the fact that 2Do can sync with Dropbox, iCloud, Toodledo, and custom iCal servers. 2Do is compatible with Siri. That means you can add reminders to your 2Do lists using Siri. The app supports smart lists based on saved searches too. Location-based tasks are also available. Best of all, you can export your task lists via email or as a CSV file. 2Do for iOS is not cheap. At the same time, it looks superb and offers a ton of useful features. It is one of the best task managers we have tested.